But the multiples of tens give more problems; SL should allow e.g. 00 (double zero) or O (capital o) rendered as a '0' (zero, and not as currently: 10) to show a multiple of ten. 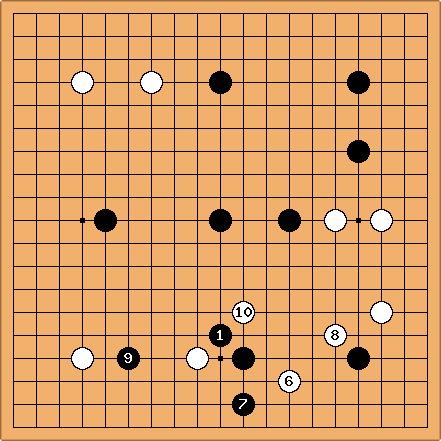 Bill: You may see this kind of relative numbering in go magazines, especially where the move numbers are in the triple digits. 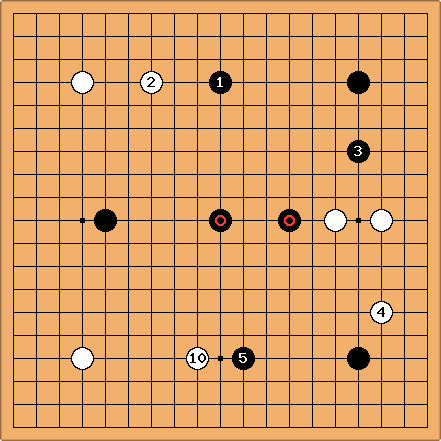 A diagram may show, say, moves 134 - 155, numbered as 1 - 22. How about using a more specific convention for variations on SL. The basic idea is that every diagram is a continuation of a previous one (except if a root diagram). The root diagram is numbered 1; variations are 1x, giving further variations like 1xy etc. This assumes that no more than 10 variations exist (otherwise, use 2 digits for each level). Variations in a diagram (that lead to a new diagram) are numbered by simply appending the variation number (1,2, ...) to the diagram. Note:The text "continuation from ..." and the link to the parent diagram seems straightforward to write. This scheme assumes that no major editing (i.e. inserting variations) will be needed. once checkmate, the game disappears; no occasion to "sign it off". Note: a tabbed browser (e.g. Firefox, Avant -> especially interesting for IE users) makes it easier to play simultaneously on several sites.